Hanoi (VNA) – Airports across Vietnam have been ordered to tighten aviation security following cyber-attacks at Tan Son Nhat and Noi Bai international airports in the afternoon of July 29. 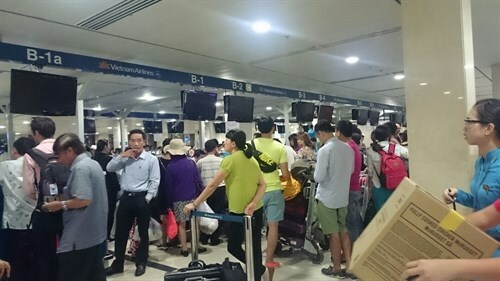 In its press release, the Civil Aviation Authority of Vietnam (CAAV) said the attacks interrupted the airports’ electronic check-in systems, so check-in procedures were handled manually. Airports were also requested to intensify checks at crowded areas with screens installed to prevent similar happenings, the CAAV added. In a short interview with the Vietnam News Agency, Deputy Minister of Transport Nguyen Nhat said hackers took control of the screens showing Vietnam Airlines’ flight information at the two airports, but were unable to break into the search and ticket-booking systems. The flight operations and security systems at the airports still worked normally, he added. The computer systems at Tan Son Nhat airport in Ho Chi Minh City and Noi Bai airport in Hanoi were hacked at 1:46pm and 4:07pm on July 29, respectively.